Home » Debt Reduction and Management » Is It Smart to Use Cash Out Refinancing to Pay Off Debt? Home mortgage and refinancing rates just keep getting lower and lower. You thought 4.5% on a 30 year fixed rate mortgage was low? They’re even lower now. Think about this: you can now get a 15 year mortgage for less than 3% if you have excellent credit. That’s crazy! I remember just a few years ago ING Direct’s savings account was paying me 4% interest. Refinancing rates have followed suit and just dropped and dropped. With interest rates at historical lows, does it now make a lot of sense to do a cash-out refinance in order to pay off debt? If you have some equity in your house on one side and a pile of credit card debt on the other side, you have what amounts to a math equation. If you could take some of that high-interest credit card costing you 20% interest and convert it to something that would cost you only 4% interest, you would come out ahead. Far, far ahead. Let’s look at some examples. To come up with a perfectly detailed example we would need to know how far into your mortgage you are, compare total interest paid with the mortgage and the credit card to with a refinanced mortgage, and so on. However, just using some basic examples will well emphasize the point. This is the beauty of using equity in your home to better your financial situation. You’re able to cut your monthly payment back by $304 while saving a ton of interest. You see you can pull off the paying off debt with equity thing once. Just once. When you do it you have to cut up the credit card, reel in your spending, and truly make behavioral change with your finances. If you don’t? You are financially doomed. Here’s how the cash-out to pay off debt can take a really negative turn. You pay off your credit card and celebrate. You get your budget in order and really watch your finances for a few months. Then an unexpected bill pops up. 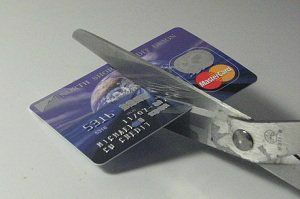 You get that credit card back out (that you didn’t cut up), and put the cost on there. Your plan is to pay it off next month. Then something else happens. And another emergency hits you. And then your second cousin gets married and you have to buy a wedding gift. Then your hours at work get cut back. You’re right back where you started except you have an extra $20,000 on your home mortgage. Your mortgage payment went up $96, which when considering a drop from the original $400 minimum on your credit card, was a great deal. But now your credit card is back to $20,000 at 20%. You’ve got another $400 credit card payment on top of the $96 increase in your home mortgage payment. Oh, and you’re out of equity. You can’t take more money out of your house to pay off the debt. You’re going to have to do this the hard way: buckling down and paying extra principal on the credit card. Should I Refinance My Home to Pay Off Debt? It is a risky idea that can work if you truly make a change in your financial life. But it can also blow up in your face. Borrowing more money to get out of debt usually does not work. If you can be extremely disciplined — cutting up all of your credit cards, spending less than you earn, earning more money — then it can save you a ton of interest payments to the credit card company. If you can’t handle that discipline, stay away. Jonathan: I’m a fan, albeit for different reasons. You have solid points. There’s definitely a place for this in the smart financier’s toolbox, though. To me the biggest question you have to ask yourself is did you change the habits you had before that caused you to get into this debt. If you are certain, 100%, then this would help you save money while paying down your debt. Otherwise you’re asking yourself for trouble.